When you have children, it’s important that you nurture their creativity. It’s something that they develop and isn’t a skill that can get taught. They have to learn it themselves! One of the ways to help your kids be more creative is through playtime. Children of all ages love to play in the sand! If you’re fortunate enough to live near a beach, they’ll no doubt enjoy going there on a regular basis. If there isn’t a beach in sight near you, never fear! 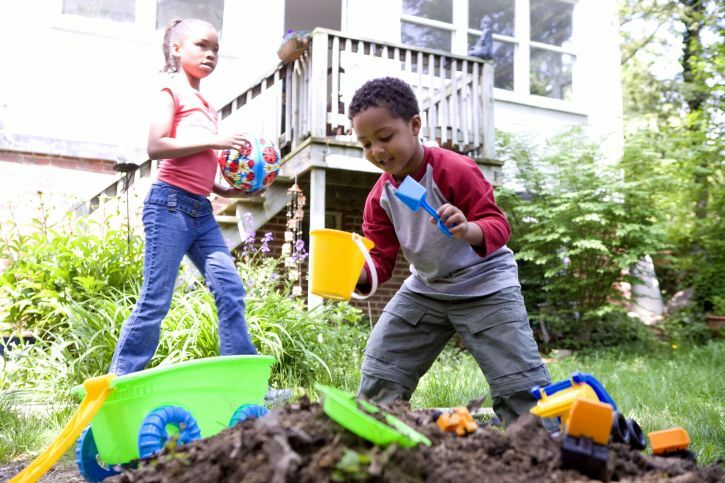 One DIY project you can carry out is to build a sandpit for your children to play in. You can buy plastic ones that you just put down on the ground and fill with sand. Or, you could build one using decking. Be sure to cover your sandpit when it’s not in use. Otherwise, it can get waterlogged when it rains! Something that intrigues almost all kids is water. Even just the mere trickle of your outside tap can keep them hooked for ages! Of course, a tap isn’t that interesting after a while. That’s why it makes sense to add a water feature to your garden. It can be anything from a statue or fountain to a shallow pond. Of course, you’ll need to supervise kids near ponds for obvious reasons. Kids love to mimic what their parents and other adults do each day. If you enjoy growing fruit and vegetables, why not build a child-friendly vegetable garden? That way you can both work together to plant things. It’s also a good way of giving them creative freedom. Especially when they get to pick the types of fruit and veggies that grow in your garden! Children love to run around and reimagine their surroundings. You might not think it, but gazebos offer the perfect way for them to do so! Your kids could turn them into small forts, for example. Or they could use them when playing hide and seek! The possibilities are endless. Gazebos are cheap to buy and easy to put up. During the summer, the adults can use them too for outdoor events like barbecues. Do you have lots of trees in your garden? If so, and you’ve got older children, why not build them a treehouse? It can offer them a retreat from your home and somewhere to play in their spare time. If you’re a keen DIYer, you could build it yourself. Otherwise, have a professional do the work for you. Treehouses could include swings at the bottom and even climbing rungs. I hope my blog post today has given you some inspiration. Let me know what you’ve done with your garden!